Compressing documents is a necessity in today’s connected world. Small files = easy-to-share files. Unfortunately, with some compression tools out there, reduced file size means reduced quality, too. Not with PDF Optimizer. With PDF Optimizer, you get enterprise-level optimization with assured accuracy and reliability. Worried about long-term preservation and document compatibility? Don’t be – PDF archiving (PDF/A) is already fully integrated into this tool. Built upon the Adobe PDF Library, PDF Optimizer will optimize files while preserving the fidelity of your original document. 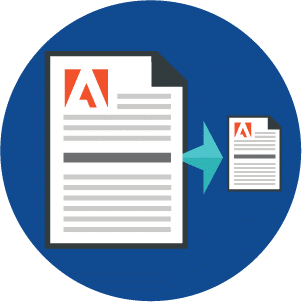 PDF Optimizer provides complete control over the optimization process, using the same technology that Adobe uses to build Adobe Acrobat. You don't have to sacrifice the quality of your documents for a smaller file size. Ready to try PDF Optimizer? PDFs are the most accessible file format, but can quickly become cumbersome when used in bulk. Decreasing PDF file size can help alleviate this issue, and PDF Optimizer can shrink PDF file size without compromising quality. Our PDF compression software tool is a great solution for enterprise and batch compression problems, making it easy to share PDFs across email, individuals, teams, and industries. With so many different file formats in use across industries, ensuring accuracy across formats and platforms is critical. That’s why PDF is so universally used and popular. Preserving full document fidelity is essential for keeping information flowing in an efficient and precise way. PDF Optimizer ensures full document integrity when creating your optimized files. PDFs contain countless amounts of information, but storage isn’t always unlimited. Archiving PDFs (PDF/A) is the answer when you are in an industry where the exchange of large amounts information is critical. Industries like legal, finance, technology, and pharma can benefit not only from file size reduction, but simplified archiving. Proper long-term preservation will ensure no information or quality loss, and make storage optimal and easy. PDF Optimizer is built upon the industry-standard technology that Adobe uses to build Acrobat. This powerful and dependable technology is used in all sorts of industries, enterprises, and cultures worldwide. For all other PDF Optimizer Developer Resources, visit our Developer Resources area. You can expand your PDF capabilities beyond optimization using our powerful SDK.